BleachHouseLibrary.ie: " Space Penguins - Planet Peril " by L.A Courtenay. Review by Mia Madden age 10.
" 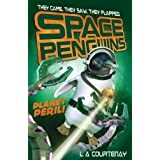 Space Penguins - Planet Peril " by L.A Courtenay. Review by Mia Madden age 10. This is the story of four penguin friends who have travelled to Planet Splurdj in their spaceship, The TunaFish. When they land they meet King Hubba Blubba and go to the new space zoo. The Oozis are evil snot-coloured aliens who are trying to capture the space penguins for the space zoo. Space Penguins - Planet Peril is published by Stripes Publishing and is available in paperback.